This year, the Queen Mary will be ringing in the New Year with a party entitled, “Aude Lang ‘Shine.’" The party will give tribute to the 1966 journey around the Mediterranean with culture, food and entertainment. Italy, France, Spain, Greece, Morocco, Egypt and the USA are represented and each country will have a portion of the main deck attributed to it. Guests can bounce from country to country enjoying entertainment such as a Moulin Rogue Cabaret in France and The Gypsy AllStars in Spain. At midnight, guests will be treated to a NYC New Years with a Rockette-style countdown and fireworks show. 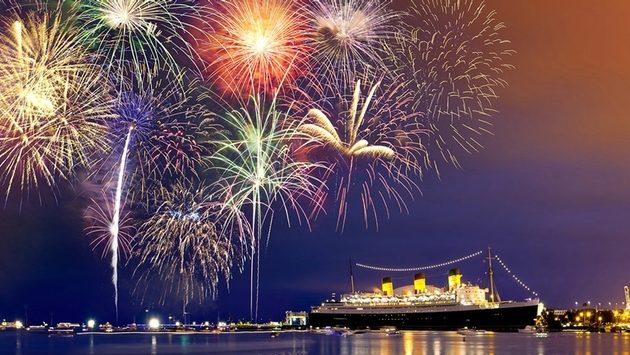 “There’s no better way to celebrate than aboard a ship that's hosted New Year's Eve guests for 80 Years. An annual tradition for many, we strive to create an unforgettable night each year. Auld Lang ‘Shine’ will be one of the best yet, a glittering celebration into a new year," said Steve Sheldon, Director of Entertainment Events for The Queen Mary. All party goers must be 21+ and general admission as well as VIP tickets are on sale. Reservation and walkup dining options are available as well as hotel packages.